There are so many solutions out there that claim to repel mosquitos, but they rarely deliver on the promises they make. But after trying several ourselves, we finally found one that worked surprisingly well. 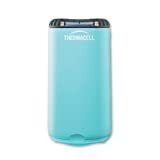 The Thermacell MR-PSL Patio Shield Mosquito Repeller is a $25 gadget that claims to create a “15-foot mosquito protection zone.” Guess what: it does. Nothing is perfect and there are people who claim that is doesn’t work very well for them, but we have a feeling they were expecting a miracle device that would keep their entire yard mosquito free. Unfortunately, this device isn’t magic, but it is a very good mosquito repellant that keeps the immediate area clear of blood suckers.